Woodbank Surgery have chosen to donate our reinvestment of £250 to the Bolton Hospice, who provide specialist care and support for the people of Bolton who have life-limiting illnesses. They provide care throughout a patient’s illness, so they can achieve the best possible quality of life, including end of life care. 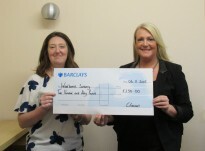 Bolton Hospice are a charity, mainly funded by local people. Together they need to raise around £3.2 million a year to continue providing their services for free. Every little helps!